She had good company; she was Voltaire’s lover and companion for fifteen years, and she built a private research institution out of a château with him before falling in love with a younger poet. She was tutored in math by Maupertuis and corresponded with Bernoulli and Euler. She was an avid gambler and handy with a sword. She died early, at 41 years, but those years that she did live were pretty amazing. Émilie was born to a noble family in Paris in 1706. She was the youngest of six children, and the only girl. Her father made his living as a social assistant to Louis XIV. He doted on Émilie and did everything he could to nurse her astonishing intellect. Each week, he invited brilliant scientists and writers into the family salon, and let Émilie sit in on these meetings of the minds and ask questions. With her father’s help, Émilie learned fencing and riding, studied math and science, and became fluent in several languages. When she’d exhausted the knowledge of her tutors, Émilie started educating herself. The more intelligent she grew, the more horrified and furious her socialite mother became. She often threatened to send Émilie off to a convent, which was the normal route of education for French girls in the 1700s. When Louis XIV died, her father lost his job and Émilie’s dowry began to suffer. Her mother sent her to live in the noble court at Versailles so she could find a husband before it was too late. At first, Émilie didn’t take the matter seriously. When she ran out of money to buy books, she used her math skills to win more by gambling. She also engaged in a public sword fight with a professional soldier that ended in a draw. Eventually she realized that her father wouldn’t be there forever. She needed to marry into a wealthy family or else would end up in a convent for life as an abandoned woman. She started paying attention to the Marquis Florent-Claude du Châtelet. He was an army general and nearly twice her age, but Émilie’s father was certain that he would give her a good life, including the freedom to pursue her studies. Back then, it was not unusual for the upper classes to marry for status, then have affairs as they pleased. In Émilie’s estimation, her new husband was “a touch dull but decent–and unbothered by his brainy wife’s intellectual and amorous adventures.” Over the next five years, Émilie traveled with Florent-Claude wherever his military career took him, giving birth to two sons and a daughter along the way. In 1730, she moved back to Paris to resume her studies and her social life. 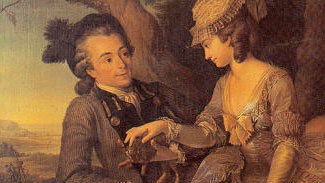 Soon after, she became friends with the philosopher and playwright Voltaire. Finally, she’d met her intellectual equal. They had an immediate chemistry and found much to say to each other on many subjects, from philosophy to science to political reform. She and Voltaire never made any attempt to hide their affair around Paris, which many found shameful. Voltaire was known for being critical of the crown. He’d recently written Lettres philosophiques in which he rakes French politics and society over the coals. Around this time, he was advised by a friend that there was a warrant out for his arrest, and that he should hide. 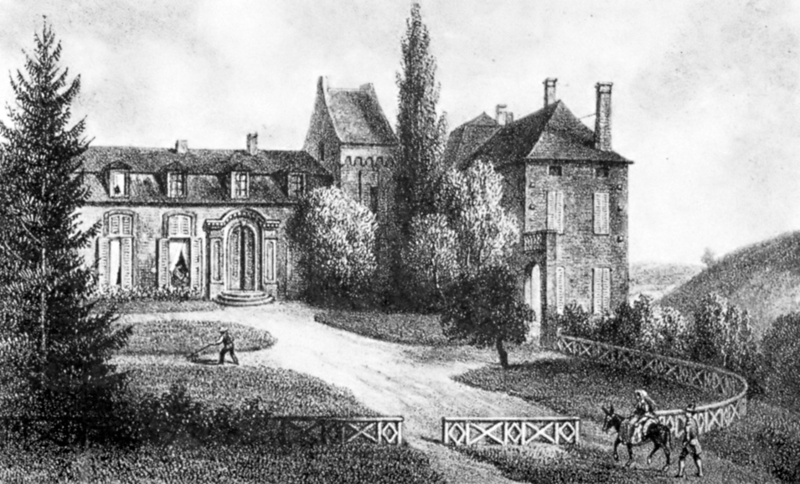 Émilie and the Marquis invited him to escape to Château du Cirey, their mansion near the border of Champagne and Lorraine. The location was ideal for Voltaire, because he could go back and forth over the border when the heat was on. In exchange, Voltaire agreed to fund some much-needed château repairs. Voltaire and Émilie had a great influence over each other. She eventually gave up her social life to join Voltaire at the remote château, and they evolved into the intellectual power couple of the Enlightenment. They turned the château into a sort of private research institution, inviting a number of the great minds of the time. She began a deep study of algebra and calculus under the tutelage of Pierre-Louis Maupertuis, who introduced her to Isaac Newton’s ideas. Mulling over Newton led to her writing Institutes du Physique, which is regarded as her greatest philosophical contribution. In it, she explores and combines the ideas of many philosophers about religion, philosophy, and the natural world. During this period, the dominant theory surrounding the nature of heat was that combustible substances contained something called phlogiston that is released during combustion and is responsible for what’s now called oxidation. Well, Émilie didn’t believe in the stuff. She and Voltaire set up a research laboratory in the château to study the nature and propagation of fire. Émilie’s research surfaced a few years later when she published a paper which gave great insight into the nature of light, suggesting that different colors of light had different energies, and hinting at the existence of what we now call infrared as the main carrier of heat. Around 1740, Émilie began to translate Isaac Newton’s Principia into French. 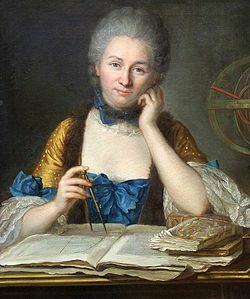 Her fluency in Latin combined with her intimate knowledge of Newton’s mathematical physics uniquely positioned her as one of the best people for the job. Émilie further claimed, in an additional chapter to the translation, that different types of energy — potential, kinetic, and heat — must be in the same units to be interchangeable. 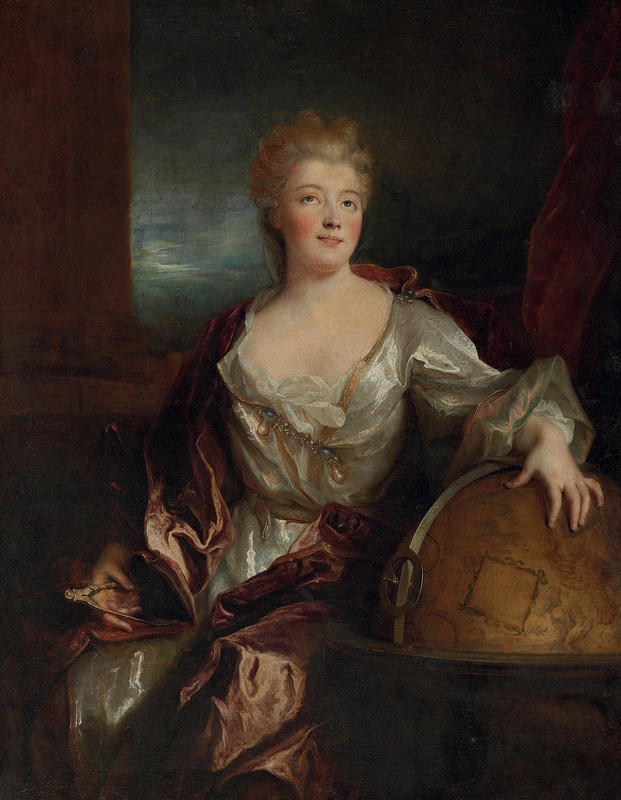 This was one piece in the big puzzle that would later become Lagrangian mechanics, and probably the most du Châtelet’s most important contribution to science, made in what would be the last year of her life. Things had cooled romantically between her and Voltaire by the end of the decade. Émilie found a new lover, a young poet of the noble court. But he couldn’t keep up with her and her egg-headed friends, and turned cruel toward her. She became unintentionally pregnant by him at the age of 41, which was more or less a death sentence for a woman in the 1700s. Émilie worked feverishly to finish translating the Principia before the baby came, fearing the worst. A few days after her daughter was born, Émilie died of a pulmonary embolism. Her husband, Voltaire, and the young poet were all at her side. thanks for this little piece, which I enjoyed thoroughly. It must have been strange to live in France at that time. All those new ideas flying around! I love these articles about historical “hackers” and even though they are “not-a-hack”, they are still valueable. I’m surprised she isn’t credited more with the conservation of momentum into the more general conservation of energy. The whole Lagrangian apparatus took a surprisingly long and winding road through a who’s-who of physicists and mathematicians of the time. Giving anyone “the credit” is always going to be an oversimplification. The link (to Stanford?) in the story about her views on the philosophy of science is also really neat. I’m glad all those women contributed to our science! Very interesting item. The muddy history surrounding developments by Newton, Hooke, and Liebnitz et. al are fascinating. Newton’s insistence on using (painful reading) geometric proofs in his book have obscured much of the thinking. Is there an English translation of her French translation. “Things had cooled romantically between her and Voltaire ” shouldn’t that be “she and Voltair”? Re: “her’ vs. “she”. In English all prepositional pronouns are object pronouns (me, him, her, us, them) and not subject pronouns (I, he, she, we, they). The object of the prepositional phrase “between her and Voltaire” is “her and Voltaire”. You wouldn’t say “Things had cooled romantically between they”, right? If you’d use “them”, you’d also use “her”. Kristina, thanks for yet another “Herstory” lesson. This one is especially amazing to me. I always fell like an idiot reading about these great women I knew nothing about. I suppose this is what happens when men right the history books. Great job. Opps, that was supposed to be “feel” and not “fell. Yes, ha ha. How did I miss that? I take it that you’re not a wordwright! Awesome article, thank you for including it…. sort of reminds one of the Dr. Who episode “The Girl In The Fireplace”, and Highlander (her sword fighting). I want an epic movie of her life. Or Netflix/Amazon series. There was a fairly recent play that got great reviews.